Known in Spanish as a honey-sucker, the hummingbird is an amazing creature, some even migrate from the tropics all the way to Alaska each year, living off of the nectar of flowers. In Aztec tradition, the hummingbird was the animal counterpart of the god of war, Huitzilopochtli. This is due to the powerful, tiny bird’s ability to maneuver in the air, and its fearless nature. Hummingbirds will duel one another and hold their own with large birds – even eagles. In Mayan tradition, the hummingbird is named for the sound it makes when it flies: tsunu’un. Hummingbirds are fiercely independent, except when mating. They are master architects with amazing, meticulously designed nests. Beauty in the home is important to the hummingbird. The hummingbird flaps its wings so quickly, it creates a strong, balancing vibration throughout its body. Hummingbirds are immensely medicinal, both in vibrational medicine and in working with flowers. A hummingbird can make a figure eight with its wings, and therefore is a symbol of eternity, linking at the heart, past and future. A hummingbird is the only bird that can fly backwards. It is such a being of air – it cannot walk on the ground. A hummingbird’s visit imbues us with the ability to do the impossible. 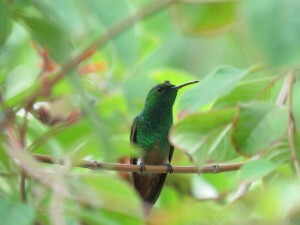 The hummingbird, with its green and rosy hues, is a humming, heart chakra clearing bird of LOVE. It can clear negativity, guilt, and shame. Because they calibrate past and future, the hummingbird brings us to the PRESENT MOMENT in our HEARTS. Hummingbird totem people need good rest at night and regular meals – a high energy spirit can burn itself out quite easily. They are quick tempered but balanced, capable, fast movers. They are fiery and have strong healing abilities. If a hummingbird has come into your life, it may be time to move flexibly and adapt to tight curves and fierce ups and downs with the skill you innately possess.This little daredevil of the sky reminds us of big power in small packages, and calls us to feel joy in the sweetness of the summer flowers.